21-September-2018 Another Feather in the cap of Mahaveer Public School" Hemant Mudgal class X won Bronze medal in SGFI JUDO championship held at KOTA in September 2018 . 18-September-2018 "Proud moment for Mahaveer Public School" Manav Gupta class VIII won Silver medal in SGFI STATE LEVEL TABLE TENNIS tournament held at Jodhpur in September 2018 .He has qualified for NATIONAL LEVEL . 13-September-2018 Congratulations! In the SGFI District Judo Championship held at Jaipur from September1-4, 2018 following students won medals Hemant Mudgal (X) Gold Agresh Agnihotri(VIII)Gold Himanshu Mudgal (X) Silver The Gold medalists have been selected for State Level Judo Championship. 02-June-2018 Mahaveerians prove their mettle once again!! Rajendra K Godha-President Umrao Mal Sanghi-Secretary Rakesh Kumar Jain -School Convenor , All members of the school executive committee & Rashmi Talwar -Principal extend their heartiest congratulations on Securing AlI India Rank AILET 2018 Madhav Mitruka AIR 21 (Class XII - E) Aditi Goyal AIR 124 (Class XII - C) & CLAT 2018 Madhav Mitruka AIR 64 Aditi Goyal AIR 133 Well done ! 30-May-2018 Mahaveerians nail it again.!! Rajendra K Godha-President Umrao Mal Sanghi-Secretary Rakesh Kumar Jain -School Convenor , All members of the school executive committee & Rashmi Talwar -Principal extend their heartiest congratulations on the Historical achievement in Class X 2018 100% result! 25 Students securing 90& above percent 36 Students securing perfect 100 Highest score - Virendra Kabra,98.4% Accolades once again. 26-May-2018 Prodigious feat for Mahaveer Public School !! Rajendra K. Godha-President Umrao Mal Sanghi-Secretary Rakesh Jain-School Convenor, & Rashmi Talwar-Principal extend their heartiest congratulations to all the students for 100 % result in AISSCE 2018 CLASS XII Highest score in Science - Daksh Rawat,96.6% Highest score in Commerce - Naman Sanghi ,97.8% HIGHEST EVER IN THE HISTORY OF SCHOOL Congratulations ! !We are truely proud of you. 30-Mar-2018 Congratulations to Master Virendra Kabra of class X for securing 1st position in the Merit list of the coveted State Talent Search Exam-2017 conducted by RBSE with 96.11%. Congratulations ! !We are truely proud of you. 6-Feb-2018 Congratulations!! Divyansh Bhatt of class 9th and Anshika Kapoor of class 8th, Mahaveer Public School have won 1st and 2nd prize in the Inter School Paper Reading and Essay Writing Competition respectively. 4-Feb-2018 Glorious moment for Mahaveer Public School !! Congratulations to Master Virendra Kabra of class X for securing 1st position in the Merit list of the prestigious NTSE -2017(1st level). 13-Nov-2017 Kudos!! Mukul Samaria & Adarsh Bagaria of class 11th won the first prize in the 'Launch Your Product' Inter School Competition held on 10/11/2017 at Tagore Public School, Shastri Nagar. 14-10-2017 Congratulations! At the CBSE West Zone Judo Championship held at Tonk from 3rd - 7th October, 2017 following students won medals: Manav Prajapati XI Gold Agresh Agnihotri VII Silver Deependra Sharma IX Silver Hemant Mudgal IX Bronze Himanshu Mudgal IX Bronze Manav, Agresh and Deependra have been selected for National Level Judo Championship to be held at Secunderabad. 12-10-2017 Congratulations! In the SGFI State Archery Championship held at Bikaner from 24-29 September, 2017, Anisha Sen of class IX has won 02 Gold Medals in U/17, 30 mts & 40 mtrs event. She has been selected for National Level Archery Championship to be held at Chhattisgarh. 13-Sep-2017 Congratulations! 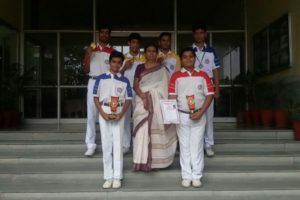 In the SGFI District Judo Championship held at SMS Stadium from 1-4 September, 2017 following students won medals: Manav Prajapati XI Gold Hemant Mudgal IX Gold Yash Yadav VII Gold Agresh Agnihotri VIII Gold Himanshu Mudgal IX Bronze Devesh Sharma IX Bronze All 4 Gold medalists have been selected for State Level Judo Championship. 03-Aug-2017 Congratulations! Juned Khan of class IV Mahaveer Public School has won Gold Medal in the 9th Mini Rollball National Championship held at Guwahati from 28-30 July 2017. 28-July-2017 Good News! Mrinal Jain of class 12th Commerce, 2016-2017 batch of Mahaveer Public School, secured All India Rank -2 in CPT entrance 2017. 24-May-2017 Top Good News! Krishna Singhal of class 12th Commerce, 2016-17 batch of Mahaveer Public School, tops Rajasthan in the Symbiosis Law Entrance Exam (SET Law). 01-May-2017 Hearty Congratulations! In the All India Oxyopia Examination 2016 our students performed exceedingly well!! Ujjwal Agarwal of class 12th got AIR 2nd & won a tablet,medal & certificate. 24-Apr-2017 Congratulations! Divyansh Bhatt of class IX won the 3rd prize in the Inter School Debate Competition held at Rotary Club, Jaipur on April21,2017. 08-Mar-2017 Good news from CBSE!! Ashish Mittal (Physics )and Lukansha Gopalan (Accountancy) of class 12 Mahaveer Public School have been awarded the Certificate of Merit for being in the top 0.1 percent CBSE Board Merit 2016. 25 students of class 10, scoring a perfect A1 grade,in all five subjects in,2016 CBSE Board Examination were also awarded the Certificate of Merit. 30-Dec-2016 Congratulations! In the CBSE National Athletic Meet held on 29th December 2016 at Vadodara,Gujrat Kirti Sharma of class 12 won Bronze Medal in 3000mts race. "Ujjwal Soni of class 6th represented India in the South Asian Grappling Championship 2016 held at New Delhi and secured 1st position. " "In the Jaipur District Khelo India Sports Competition held at Jaipur Sports Complex from 5-8 December,2016 following students won Gold Medals and cash prize of Rs.1500 each in 4*100mts relay: Madhusudan Singh XI Abdul Bari XI Manan Ohri XI Nikunj Agarwal VIII "
"In the Jaipur District Khelo India Sports Competition held at Jaipur Sports Complex from 5-8 December,2016 in Judo Raghav Yadav of class X & Manav Prajapati of class XI won Gold & Silver medals along with a cash prize of Rs. 1500 & Rs. 1000 respectively. " Harshit Sethi of class 7th creates history by reaching the Semifinals of U/13 Boys Doubles Sub Junior National Badminton Championship held at Vijaywada A.P. In December. Team from Rajasthan reached the Semifinals after 30 years. " "In the CBSE National Judo Championship held from Nov26-29,2016 at Bhopal, M.P.,following students won Bronze Medals: 1. Manav Prajapati XI 55kg 2. Raghav Yadav X 50kg "
26-Nov-2016 Congratulations! 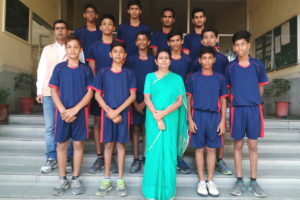 In the CBSE Cluster XIV Athletic Meet held from Nov21-24,2016 following students won Bronze Medals in 4*400mts relay: Madhusudan Singh XI Abdul Bari XI Manan Ohri XI Nikunj Agarwal VIII Digvijay Singh IX Kirti Sharma XII won Gold and Bronze Medal in 3000 & 1500 Mts respectively and has qualified for CBSE Nationals. 08-Nov-2016 Congratulations! School team has won 2nd prize in the Inter School Wall Painting Competition organized on October 20&21,2016 by Traffic Police & Muskan NGO. 26-Oct-2016 Congratulations! At CBSE West Zone Judo Championship held at Jodhpur(21-23 October 2016) 1.Raghav Yadav,class 10 won gold in U/17 50 kg category. 2.Manav Prajapati class 11 won gold in U/17 55 kg category . Both have qualified for CBSE nationals. 22-Oct-2016 COngratulations! 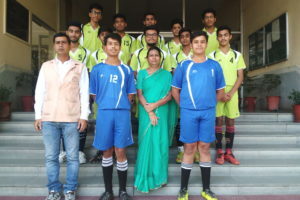 1.School's Lawn Tennis Team comprising Yashvardhan Batwara & Aryan Lalwani, of class 8th won silver medal in CBSE Sahodaya Lawn Tennis Tournament held from 18-20 October at Neerja Modi School. 2.Manav Gupta, class 6th won silver medal in CBSE Cluster U/14 Table Tennis tournament held from 18-21October at Chittorgarh. 1.School's Lawn Tennis Team comprising Yashvardhan Batwara & Aryan Lalwani, of class 8th won silver medal in CBSE Sahodaya Lawn Tennis Tournament held from 18-20 October at Neerja Modi School. 2.Manav Gupta, class 6th won silver medal in CBSE Cluster U/14 Table Tennis tournament held from 18-21October at Chittorgarh. Arushi Patni & Krishna Singhal of class 12th won the 2nd prize in the Inter School Digital Advertising Creation Competition held at Apex International School on 18/10/2016 as a part of CBSE Sahodaya Fest 2016. Mahaveerians made us proud again! At the Inter School Debate Competition held on 16/10/2016 at S R Global Academy, Aryan Saharan class 11th won 2nd prize worth ₹9000 & Prachi Gupta class 12th won 3rd prize worth ₹5100. Bagged 2nd overall position. Pulkit Sharma, class 11th of won Bronze Medal in the CBSE West Zone Taekwondo Championship in the U/19 below 60 kg category held at Sagar, MP. Aryan Saharan & Vaibhav Vyas of class 11th, won consolation prize of Rs.2000 each in STSE 2015 exam conducted by the Board of Secondary Education,Rajasthan. Harsh Soni of class 6E, won Bronze Medal at the 10th Sub Junior State Wushu Championship held at Churu, Rajasthan on September 17 2016.
was felicitated by Rotary International with District Award for being the Best Interact Club in District and Rotary Club Main, awarded the school for being the Best Interact Club in in a grand ceremony held on September 03,2016. One more student of Ms.Shatakshi Godha of class 11th has outshone others and made us proud by securing 2nd rank all over Rajasthan in Talent Search Examination for Mathematics, organised in the month of May by Rajasthan Patrika. She has been awarded with a certificate and Smart Phone. the best CBSE class X result ever in the school's history. 100% Board result with 25 students scoring 10 CGPA and 39 students scoring 9 CGPA and above . 100% class 12th CBSE-2016 Board result with 36 students scoring 90% & above. School toppers Ashish Mittal (science) scored 95.6% & Tanuj Khandelwal (commerce)scored 94.6%. 100% class 12th CBSE-2016 Board result with 36 students scoring 90% & above.School toppers Ashish Mittal (science) scored 95.6% & Kritika Tongia (commerce)scored 94.4%. School team comprising Aisha Gupta & Prachi Gupta of class 12th won the first prize among 25 teams from Jaipur in the Inter School Debate Competition held on 07.05.2016 at Brightlands Girls Senior Secondary School, Jaipur. 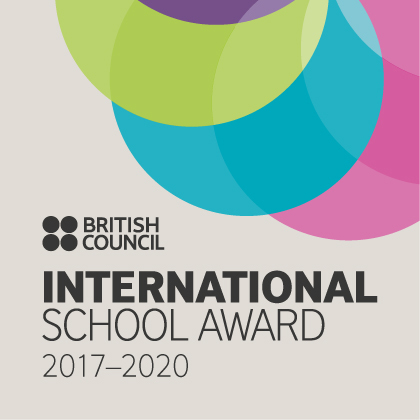 School team comprising Aisha Gupta & Prachi Gupta of class 12th won the first prize among 25 teams from in the Inter School Debate Competition held on 07.05.2016 at Brightlands Girls Senior Secondary School, . 03 students won a total cash prize worth Rs.1,20,000 in Mirchi Science Innoviad. At SGFI National Judo Championship held at New Delhi 6-9Jan2016,Harshit Khandelwal class XII won Gold medal in under 19 category. Dec 16, 2015 Laurels again! 1. Puru Purohit & Devesh Rawat of class IX won the 1st position in the Inter School Antakshari Competition held at SMDJ school. School bagged the 2nd prize in Inter School Bagpipe Band Competition held at SMS school on Oct. 04,2015. Oct 3, 2015 We are glad to share that in the Inter School Solo & Patriotic Group Song Competition organized by Rotary Club Jaipur on Oct. 2,2015 Purvika Jain of class 10th bagged the I prize in solo song & school team of bagged the II prize in group song. Sep 28, 2015 You will be glad to know that Mrs. Rashmi Talwar, received the prestigious Education World All India School Ranking Award 2015 for the School’s 3rd rank all over Rajasthan & Jaipur in a grand ceremony held at Vivanta (Taj), New Delhi. Sep 14, 2015 We are pleased to share that Arpan Bumb class 11th of has made us proud by clearing the II & final stage of NTSE exam. He will get a scholarship of Rs.1250 per month for class XI & XII, Rs. 2500 per month for UG & PG and scholarship acc. to norms for PHD. Sep 10, 2015 We are pleased to share that Purvika Jain class 10th of has made us proud by being selected from IX-XII Category for a cash award of Rs 2500 among 12 students selected from all over India in the on-line Avishkar Quiz Series started by CBSE New Delhi. Sep 2, 2015 You will be glad to know that Human Resource Development Minister Mrs. Smriti Irani has appreciated the commendable performance of the school through a personal letter sent to the Mrs. Rashmi Talwar for her able leadership and managerial skills. Letter of appreciation have also been sent to the class 12th School Toppers , class 10th students scoring a perfect 10 CGPA & PGTs & TGTs teaching these students. Aug 28, 2015 We are pleased to share that is ranked NO-3 in Rajasthan in Education World India School Ranking 2015. Great news again, Sheshansh Agarwal of stood 1st among top 10 Allen students all over India and received a cash prize of Rs.1.5 Lacs, gold coin & memento. Aug 5, 2015 We are pleased to share that Manvi Jain class 9th of has made us proud by being the only student selected from Rajasthan for a cash award of Rs 2500 among 14 students selected from all over India in the on-line Avishkar Quiz Series started by CBSE New Delhi . Jul 20, 2015 We are glad to share that a foreign delegation of 20 members from USA chose to visit our school out of the top schools of India on 18/07/2015 and interacted with Management, Teachers and Students to have a deeper insight into Indian Culture and Philosophy of Jainism.They were highly impressed with the School’s Education System. Another Good News! Rishabh Patni of class 12th selected for the prestigious ‘Dhirubhai Ambani Scholarship 2015′. Sheshansh Agarwal of for being 1st Indian Student to represent India 4 times in International Olympiads. Also for 1st Rank in Rajasthan & 4th AIR in JEE Main 2015 & 58th AIR in JEE Advanced 2015. Sheshansh Agarwal for being 1st Indian Student to represent India 4 times in International Olympiads.Also for 1st Rank in Rajasthan & 4th AIR in JEE Mains 2015 & 58th AIR in JEE Advanced 2015. Jun 19, 2015 Congratulations ! JEE Advance AIR 58 rank and 3rd rank in Jaipur. The school Management, and Teachers of commend you for your dedication and relentless hardwork. May 28, 2015 Congratulations Class X ! May 25, 2015 Best result ever! 100% Class 12th CBSE Board Result. Arpan & Mrityunjay, XI selected for CBSE National Science Exhibition to be held at Gurgaon (23-25 April). Congratulations! at the Credent Award Ceremony held on Feb 07, 2016 at Deep Smriti Auditorium 02 teachers Mrs. Preeti Mathur & Ms. Asha Arora were felicitated with most promising teacher award 2016. 16 students were also awarded for securing position among top 25 students from all over India in various Oxyopia Exams. Mst. Tushar Soni of class 10th got AIR Rank 1 in Oxyopia Exam and won a laptop, medal & certificate. Congratulations! Aisha Gupta & Prachi Gupta of class XI won 2nd & consolation prize respectively in the inter school debate competition held on 05/02/2016 at Rotary Club Jaipur. Great News! Ritika Khandelwal, Class X cleared the NTSE- Level 1 Exam & Ashish Mittal of class XII cleared STSE 2015 with 3rd rand all over Rajasthan. Ashish Mittal of class XI has achieved All India Rank eleven in KVPY 2014 (Stage II) the most prestigious fellowship programme conducted by IISC Bangalore the department of Science and Technology, Govt. of India. KVPY fellows are given fellowship. Arpan Bumb of class X has sucessfully cleared NTSE stage I Exam 2015 with state rank five.